Master Marf: OMFG, We didn't all die! So it looks like we didn't all die from 2007 TU24, so I guess the Large Hadron Collider is once again, the next on the list. 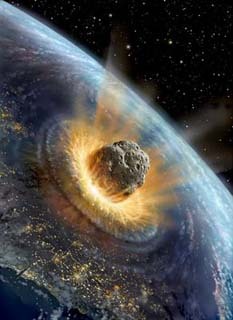 Notice, however, that the media didn't really cover the asteroid until after it passed? I don't believe the Large Hadron Collider is a threat either. The deal with it is, there's a chance of creating micro black holes. Of course, that freaks a lot of people out. As the most supported theory goes, Hawking Radiation will cause a micro black hole to evaporate before it can interact with anything, thus avoiding the disaster of the mini black hole consuming Earth. One reason I'm inclined to believe it poses no threat is because we've been bombarded by far more energetic particles from nature, that had a greater chance of creating a micro black hole on Earth. In other words, nature's already did it and we survived just fine. We're already in a global war + evrybody's already obviously insane. Global warming is in full swing and as for the changeing of the earths magnetic field it will happen on Dec. 21, 2012. We're not long for this world I'm afraid. Your right of course about nature already bombarding us with high energy radiation - thats exactly what cosmic rrays are of course. here's a thought though ( just to give you a sleepless night he he). My money is on number 17 as well - mass insanity is with us already given the number of fundamentalist religious believers, believers in astrology etc etc - its like were drifting back to the dark ages. No wonder your depressed Marf :-) Me - i'm gonna go down fighting the good fight on behalf of rationalism. There are a lot of crazy people out there, and a lot of gullible people out there. But if I had to choose one to put money on, I'd choose number 8 Global Epidemics. With airliners going from country to country, continent to continent; a bad disease would never be noticed in time to quarantine. Also with how many people don't wash their hands enough.